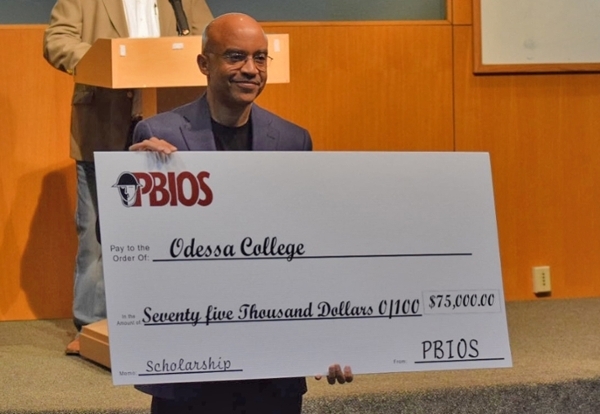 In a ceremony held on Thursday, April 27, 2017 a team of Odessa College Administrators, led by OC president Dr. Gregory D. Williams, were presented with a check for scholarships in the amount of $75,000 by the board of directors of the Permian Basin International Oil Show (PBIOS). In a press release prepared for the event, PBIOS stated that, “ The board of directors of the Permian Basin International Oils Show feel that providing scholarships is in keeping with our purpose ‘to provide education, information and activities directly related to the oil and gas industry’”. Midland College and UT PB also received checks for $75,000 at the event, while Texas Tech received a check for $30,000.